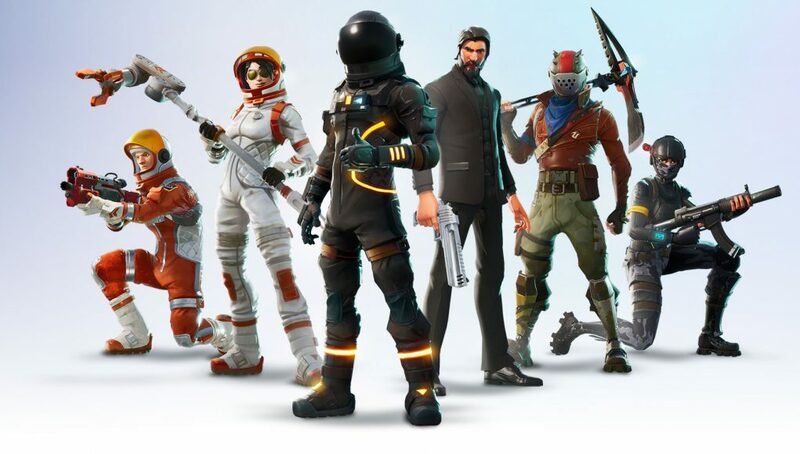 The Season 3 Battle Pass is now available in-game, featuring new Outfits, Back Bling, Skydiving FX and more! More Tiers. More Loot. More Info. Here’s some of the new stuff coming with #Fortnite Season 3.. Experience Fortnite like never before. PS4, PS4 Pro, Xbox One and Xbox One X now support 60 FPS mode, hand-tuned for each console to provide an extra-smooth gaming experience while maintaining visual fidelity. Battle Royale now defaults to 60 FPS, but you can switch back to 30 FPS in Settings if you prefer higher quality visuals. This replaces the Uncapped mode. We’ve hammered down some upgrades… turbo building, automatic material change and more! “Turbo Building” allows you to hold down primary fire and continuously place the selected building piece (Toggled in the Game options). Now you can “paint” building pieces into the world quickly. This will be very useful for defensively building walls around you and sprinting up ramps while building them simultaneously. “Auto Change Materials” will switch to another material when your current supply runs dry (this can be toggled in the Game options). In addition to “Turbo Building” this makes the building process fast and simple. It also allows for quick defensive structures from flanking with less input and worry about running out of a particular material. Sometimes it’s frustrating when your placement is blocked unexpectedly and you aren’t sure why. 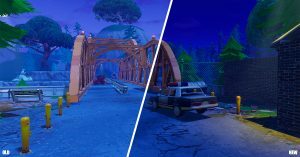 Currently, smaller objects like furniture and shrubs are destroyed when you build over them, but trees, rocks and vehicles can still get in the way. We’ve changed the building system to allow you to place structures right through large objects, meaning you can now build pretty much anywhere at anytime! NOTE: Player structures must still be supported by the terrain and other buildings. For example: A sky ramp that passes through a tree will still fall if the connection to the terrain or floor is destroyed. Switching between building pieces can sometimes feel laggy or unpredictable, especially on controllers. To improve this, we’ve changed the network code so cycling through building pieces no longer requires a round trip to Epic’s servers. Found in Floor Loot, Treasure Chests and Supply Drops. This can be found in the new “Accessibility” tab in the game’s options. There’s a strength indicator so that you can find a level that works best for you. This feature is still in development. We’d love to hear your feedback, especially if you’re unable to find a level that makes the colors better for you. Holding down the “Interact/Use” button when approaching a chest or downed ally will now automatically perform the action once in range. This also works when reviving teammates. Messaging now displays when party functionality has degraded due to server issues. This includes being able to join parties and send invitations. Easy Anti-Cheat protection added to Mac. Improved the look & feel of the game window title bar, buttons and borders on Windows. Fixed Auto-Run being cancelled when opening the map or inventory screens. Inventory icons should no longer get stuck in a selected state after being dragged out of the inventory. Improved CPU performance when activating overlaps, such as traps or triggers. Optimized grass rendering to improve overall frame rate. Fixed an issue where incorrect numbers could be shown if you enabled the “Show Net Stats” HUD option. 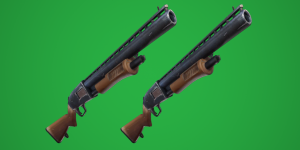 Pump Shotgun behavior has been addressed. Firing the Pump Shotgun and quickly switching weapons will now require you to pump the Shotgun before the next shot. We will be monitoring any fallout from this and continuing to iterate on how this works throughout the next patches. Grenades no longer have the ability to Crit. Removed the Valentine’s Day skin from the Crossbow. Increased Uncommon Pistol by 25%. Increased Rare Pistol by 100%. Decreased Epic Suppressed Pistol by 33%. Decreased Legendary Suppressed Pistol by 20%. Fixed the colorful outlines around weapon pickups not showing up. Fixed the Crossbow not reloading if the fire button is pressed with an empty ammo clip. Fixed the Impulse Grenade sometimes not sticking to the environment. Fixed a recoil recovery issue that caused the reticle to be in a lower position than expected after switching weapons. Optimized weapon and building selection to be much more responsive under non-ideal network conditions. Several HUD elements have been optimized to improve performance. Fixed hitching that occurred when jumping out of the Battle Bus. Fixed hitching that occurred when encountering certain skins for the first time in a match. Players now remain in control of their character for 10 seconds after earning Victory Royale! Players who do not have an Outfit equipped will now have the same Outfit both in-game and the lobby. Fixed an issue where sometimes no weapon would be equipped on first weapon pickup. Fixed the crosshair reticle disappearing in certain cases. Fixed an issue where the wrong item was dropped after switching inventory slots immediately after picking-up a new item. Fixed an issue where Supply Drops were unable to be viewed from long distances. Fixed issue where other player models could appear giant in certain network conditions. Fixed wall traps not triggering if placed behind certain stair configurations that didn’t visually block the trap. Fixed the wrong item stack sometimes being consumed when multiple instances of a stacking item are in the quickbar. Fixed a rare server crash when a player would join a match. Fixed an issue that would cause visual delays when acquiring pickups or opening chests. The fullscreen map can now be opened while spectating. The fullscreen map now displays information about what the buttons do in the top right. The path of the Battle Bus is now visible on the map prior to launch. When picking up items, we once again display the names and quantities on the HUD, with an improved appearance. Ammo count is now shown in the tooltip for weapons on the ground. Added new “Streamer Mode” setting to the Game Options menu, which anonymizes all names that aren’t squad members. When spectating players, the number of players they’ve eliminated now appears under their name. Text notifications no longer appear when a spectator leaves. The “You placed X” message now appears for only 10 seconds instead of 20 while spectating. Added a Help button to the Battle Pass tab with a list of Frequently Asked Questions. Fixed an issue where, after being eliminated, the banner rank of the opponent wouldn’t match their rank but would instead match your own. Fixed unclear description of the Emote key binding in the Input Settings menu. Fixed an issue where messages and popups were affected by the HUD Scale option. Fixed an issue with escape behavior where it was cancelling game actions rather than bringing up the menu. Downed players that were still in build mode could not open the menu. Fixed an issue where spectators would see the character model obstructing their view, if the spectated player was scoping a Sniper with their back to a wall. Fixed an issue where text notifications would show for spectators joining despite “Show Spectator Count” being disabled. Fixed not having enough visual padding between the current ammo in the magazine, and the amount left in reserve. Emoting is now available in the pre-game lobby. You can do this by clicking on your avatar > “Emote”. Banner, Boost Level, and Battle Pass Tier of party members are now shown in the lobby. The top menu in the lobby now shows expanded information on party members (similar to the in-match menu). Party Finder has been restyled with streamlined invite/join visuals. The actions you can take for each friend or invite request are now shown in-line. Ray no longer enthusiastically announces all friend invites. Fixed several cases of players failing to receive Party Invite notifications. Removed Depth of Field blur to greatly increase image sharpness for all players. Lighting during all times of day/night now match the brightness across all Quality options. Lighting contrast + intensity have been adjusted to improve contrast in certain times of day that were flat and to reduce shadows in times of day that were too dark. Fixed an issue which caused downed players to become invisible if revived underwater. Unique Audio coming to several Pickaxes + Gliders within the Battle Pass in V.3.1.0. Created new Semi-Auto Sniper world impact sounds, so it doesn’t sound as overwhelming when shot at. Implemented a fix that should resolve the stuttering and lagged audio issues that were introduced in the last update. Fixed an issue that caused the pickaxe equip sound to play when other players jumped from the bus. In rare cases, the game may crash in the frontend menus when ShadowPlay Highlights is enabled. To prevent this, please update to the latest version of GeForce Experience. After opening a Supply Drop that has been shot down, the loot will sometimes spawn in the sky and slowly fall to the ground. In rare cases, players may be unable to edit a player built structure. The current workaround is to press the edit button on an adjacent structure.